Our training sessions are held at social times at three different heated indoor pools to enable busy parents to juggle their commitments and for the swimmers to chose the level at which they wish to participate. Our training is very flexible; you can train as little or as often as you wish, although we would recommend that you do try to train at least twice a week to get the most from the club and maintain and improve your stamina and speed. We split our swimmers into two squads; junior and senior for our four weekly swim training sessions. ‘One warning and out rule’ for swimmers who are disruptive within sessions. This includes repeatedly stopping and/or impeding other swimmers; excessive stops for goggles during a set; and breaking code of conduct. This rule is not used in the case of dangerous behaviour, where the swimmer will be excluded from the session immediately. No talking when the coach/instructor is relaying instructions. Notify the coach if you would like to use the toilet. There will be no going to the toilet until at least half an hour into the session, swimmers should go before the session starts. Goggles should be correctly adjusted before the session. 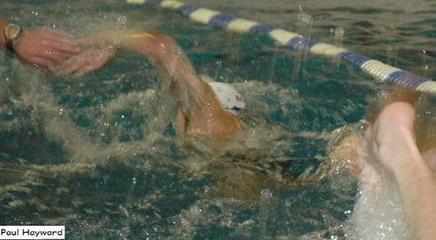 Swimmers should have a spare pair of goggles. Goggles can break during training and having a spare pair of correctly adjusted goggles can make training less stressful should they break/come loose. existing will result in the swimmer being asked to leave the pool (this is disruptive and there is enough time for goggle adjustment between sets/sessions). Water is to be filled up and not refilled until a set is finished. Swimmers who are late for 3 consecutive training sessions without good reason, or giving the coach prior knowledge, may be disciplined.